An arts organization with a great reputation for quality that deserves more recognition and support is the Omaha Conservatory of Music. The following story previewed a recent concert by the conservatory celebrating music of the Omaha Nation that brought students from area high schools together with students from St. Augustine Mission School on the Winnebago Reservation and Omaha Indian elders. Indigenous themes take center stage for a March 24 Omaha Conservatory of Music concert that culminates the school’s Nebraska Roots: Native American Music of the Omaha Indian Tribe curriculum. 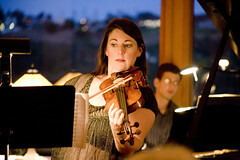 The program is also the conservatory’s annual Winter Festival Orchestra showcase. A featured presentation is the Winter Festival Orchestra performing a movement from the OCM-commissioned and Pulitzer Prize and Grawemeyer Award nominated “La pert de la Terre” by noted violinist and composer Maria Newman. A member of a Hollywood dynasty of film composers, she drew on Native peace pipe melodies for her new work. “She’s a stunning composer and she’s credited a pretty stunning work,” says OCM executive director Ruth Meints. 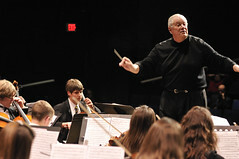 Guest conductor is David Barg, whom Meints describes as “an internationally known conductor” with “unorthodox methods” for getting the best out of young players. The 7 p.m. program at Joslyn Art Museum’s Witherspoon Concert Hall is free and open to the public. The concert caps a year’s exploration of “the first music of Nebraska.” Tribal elders Calvin Harlan and Pierre Merrick came to the conservatory, located in new digs at the Westside Community Center, to demonstrate the traditional way Omaha Indian music is performed. It’s all part of OCM’s effort to archive the music. A drum circle led by Harlan and Merrick was recorded at the OCM studio. The March concert will also be professionally recorded. CDs containing the recordings will eventually be produced with a book of the transcribed music. The idea to study, perform and record indigenous music has its roots in a 1893 book that Meints, a music educator, stumbled upon years ago. A Study of Omaha Indian Music by ethno-musicologist Alice Fletcher is a compilation of Omaha Indian chants and ceremonial music she recorded and transcribed. With Omaha Indian music a largely oral tradition and few Native speakers left, Meints thought the time right to celebrate and perpetuate traditional Native material and make it the focus of cross-cultural exchange. She says elders have shared with students stories about the meanings behind the songs and students have performed for them selections from the new compositions by Sarba. Sarba spent time on the res and in Omaha recording-transcribing the elders’ music much as Fletcher did more than a century ago. Conservatory teacher Cody Jorgensen is doing an outreach program with St. Augustine Mission students, including 2nd and 4th graders coming to sing for the concert. Until working on the commission Newman says her exposure to Indian music was “in a cliche manner” informed by her own family’s Hollywood pedigree. “We here in Hollywood have often been bombarded with real cliches of cowboys and Indians and that sort of thing, and so I was petrified to tell you the truth when I received this commission that I was going to offend somehow with my composition. I had not studied Indian music to the extent that I could understand what was going on with the small variations in tonality, intonation, musical contour. All of those things became so much more apparent when I began to study the Alice Fletcher book. Newman says “La perte de la Terra” translates literally as “A Part of the Earth” but that to French Indians it means “Lost Pieces of the Earth,” which expresses more closely what she means to evoke. For more on the conservatory, visit http://www.omahacm.org.